This is a continuation of our Florida Keys bike tour three-part blog. Day one provides overall details of our bike tour, including detailed trip planning, outfitting with Key Largo Bike and Adventure Tours and our first day on the road. As a refresher, this was a ride to celebrate my 59th birthday. Most serious road bikers would do the 100-mile stretch in one day. We opted for three days, preferring to sightsee and dine our way down the Florida Keys. Mark from Key Largo Bikes provided our bicycles, hotel recommendations, daily luggage shuttle and bike pickup at the trip’s end in Key West. He was invaluable with tips on things to do and see along the way. I’m hoping to get back down to the Keys again soon and do the same trip, or maybe travel with Mark on one of his bike trips to Cuba. Day one (covered in another blog) took us from Key Largo to Marathon. We spent the night at the Glunz Ocean Beach Hotel & Resort. Glunz is family-owned with a high level of guest service. Not to mention it has a fun outdoor bar for hanging out after the ride. Seven Mile Bridge sits about half way down the Florida Keys. Day two started by cycling through the town of Marathon, a 10-mile jaunt mostly along bike paths. A great side trip is down Sombrero Beach Blvd. at Mile Marker 50 where a two-mile bike trail takes you to Sombrero Beach. Sombrero Beach is a city park and includes bathrooms and picnic tables. It’s also a good place to snorkel. Hurricane Irma caused extensive damage here but as of December things were largely reopened. Navigate back to Highway 1 and follow the bike path to Mile Marker 47, the start of Seven Mile Bridge. If there was a stretch you could skip while biking the Florida Keys it would be this one. For seven miles you’re pedaling on the shoulder of Highway 1 hoping you don’t get a flat and hoping that motorists are paying attention to the road and not awestruck by the scenery. But it’s the only way to make the bike ride down the Keys so just grin and bike it. 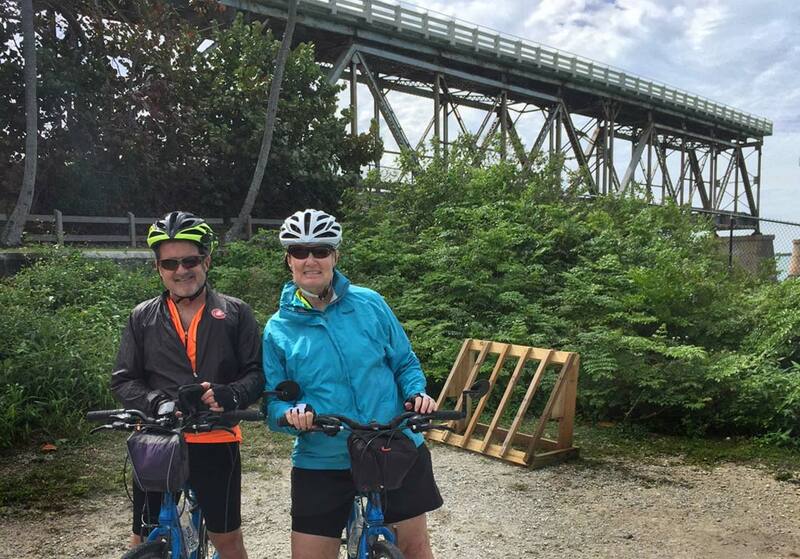 You’ll bike beside the old Seven Mile Bridge, considered an engineering marvel when originally built to connect Henry Flagler’s railroad down to Key West. The old bridge and the island of Pigeon Key are on the National Historic Register. The five-acre Pigeon Key was home base for railroad workers and now serves as a historic site. The only access is via ferry from Mile Marker 47. Ferry times are limited so check this website if you want to include a trip to Pigeon Key on your bike ride. 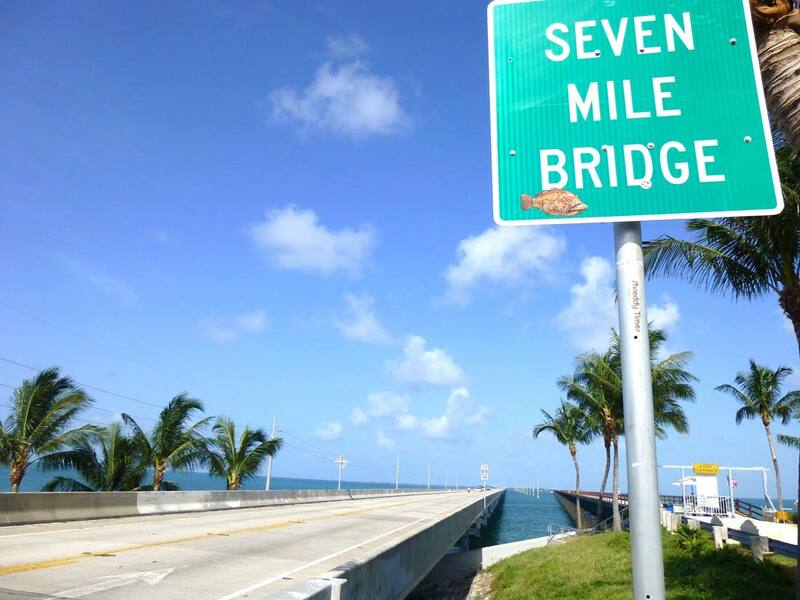 After crossing Seven Mile Bridge plan to visit Bahia Honda State Park. Plan on making a stop at the end of Seven Mile Bridge at Bahia Honda State Park. We spent a couple of hours here visiting the beaches and walking up to the steel truss railroad bridge which opened to train traffic in 1912 and was later double decked to accommodate cars. The park has food, restrooms, wifi and and offers kayak rental and snorkeling tours. Bike four miles off Highway 1 to find No Name Pub. 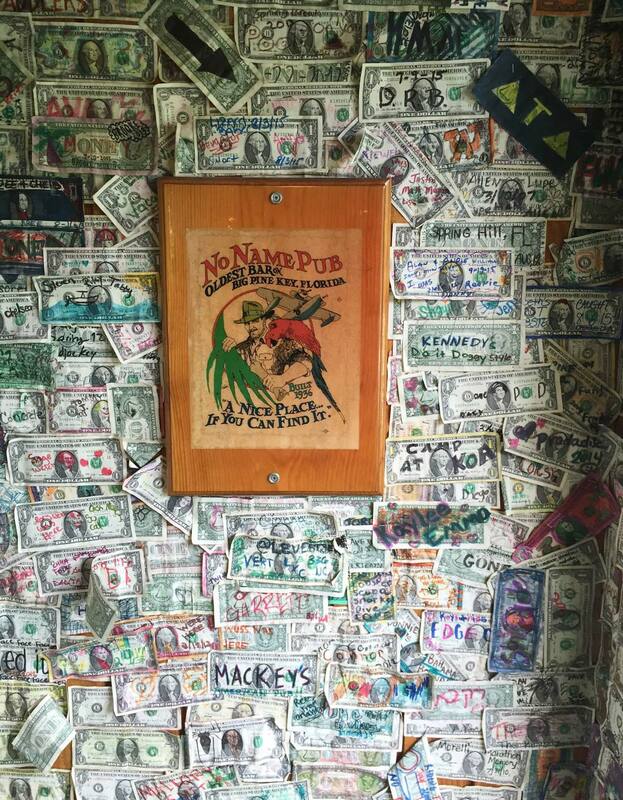 Dollar bills cover the entire interior of No Name Pub. Back on the Highway 1 bike path, your next destination of note is Big Pine at Mile Marker 31. Exit here to No Name Key and bike the island four miles to No Name Pub. The site traces its history to 1931 when it opened as a bait shop and general store. In 1936 a restaurant was added and has operated from the site ever since. At the time it opened, the only way vehicles reached Key West was via a ferry which docked nearby and everyone had to pass No Name Pub on the way south. Bridges replaced the ferry but the crowd kept coming despite the obscure location. Want a place off the beaten path? This is it. The food is surprisingly good. And dollar bills cover ever inch of the interior with people’s names and messages. The wait staff will bring you markers and a stapler so you can add your bill to the collection. 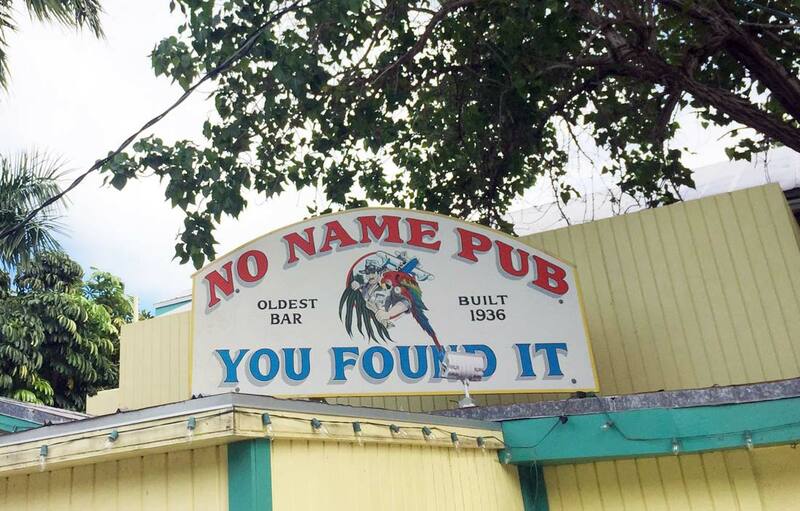 No Name Pub owners say the dollar bills began collecting this way: “The 1970s and 80s were a rowdy time of our history. Jimmy Buffett played on the juke box while people would drink, eat and dance to excess in the Pub. There was a lot of illegal money passing through the Keys back then and everyone loved to spend it. They had so much money in fact they started hanging it on our walls.” Truth or folklore? We don’t know. But it makes for a great story. We filled our bellies with food and beer. Fortunately it was just a few miles to our stop for the night … Looe Key Reef Resort & Dive Center. “Resort” is not what you think. While you won’t find them in Travel and Leisure’s list of World’s Best Resort Hotels, this is a first rate dive shop and boat charter operation which bills itself as a diver’s hotel. As long as your expectations are realistic, this is a fun place to stay. The Tiki Bar and Grill is on the property so once we parked our bicycles we were set for the night.